New Ladybug5 3D spherical camera support. Full road asphalt inspection system - road asphalt crack inspection. 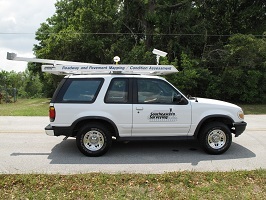 Camera on vehicle for road inspection, courtesy of EarthEye. 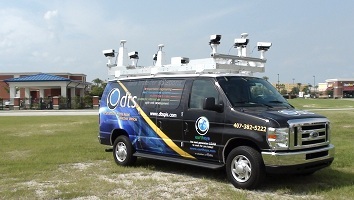 Camera on vehicle for road inspection, Southeastern Surveying and Mapping Corp.
6 or more cameras for 360 degree spherical capture. HD resolution at 60 fps or higher. Georeference images from NMEA compatible GPS. Sync image acquisition with DMI output rate: no motion, no image. 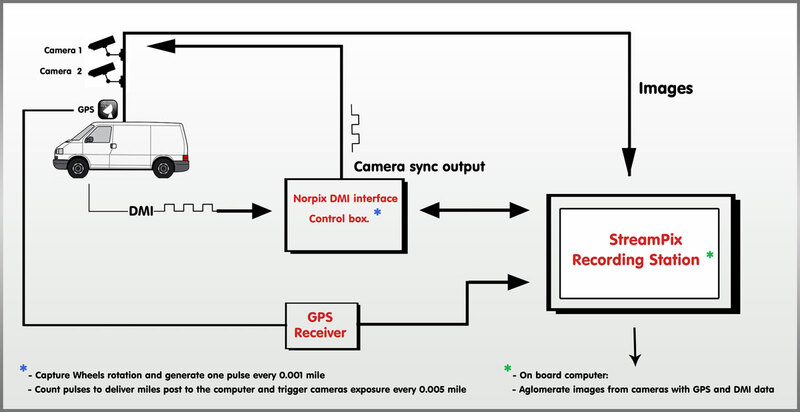 Image capture rate is synchronized with vehicle speed. Adjust capture rate as a sub multiple of the DMI output rate. Image number, DMI mile post, user comments and GPS Lat. Long. archived to a .csv file. Multiple cameras supported, ranging in resolution from VGA to 4k x 4k high resolution. Uncompressed high quality video for post processing. Jamar, Nitestar DMI devices supported. Unleash the power of StreamPix to build a comprehensive data collection system to manage roads or county assets. Combine images, GPS georeference information, as well as DMI information with our mobile application system.